What Are Lever Action Rifles Good For? 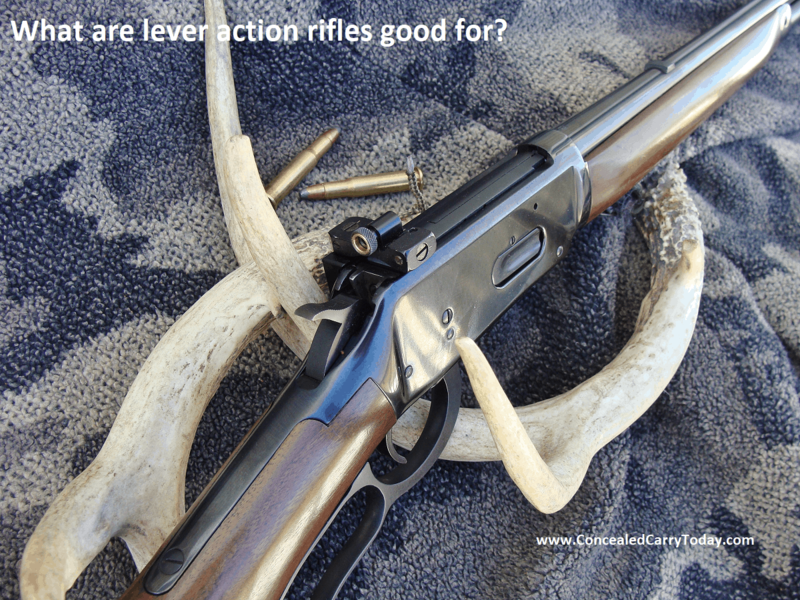 Blog What Are Lever Action Rifles Good For? We were mostly through a week-long Basic Pistol program and one trainee was clearly in the lead, no doubt thanks to a previous career with one of the largest metropolitan law enforcement agencies in the U.S. Twenty years of requalification courses left him well-equipped to address Q-type silhouettes, but now it was time for each shooter to get a turn at moving targets. Mr. Metro volunteered to go first, the mission is to engage lateral IPSC Targets from 12 – 15 yards. The targets traveled at jogging speed and the initial presentations were fairly basic, with a couple stationary steel no-shoots lurking in the background. When the smoke cleared, hits were sparse with one embarrassing clang for further indignation. Most of the other trainees were Good ‘Ol Boys with backgrounds more in tune with pickup trucks, chainsaws, flannel shirts, and deer camp. Sensing some apprehension, one of our cadre advised the next shooter to think of the mover as a deer trotting through the woods. Bingo! The light came on, as evidenced by a more than acceptable hit ratio. Same story for most of the others. How could this be? Well, in our neck of the woods, deer hunting is a tradition, based on old-school tactics minus tree-stands or food-plots. When slipping through the woods on foot targets can be fleeting, which calls for fast gun handling. The skills and firearms are passed from one generation to the next and, as often as not, the rifle will be a well-used but treasured lever-action in .30/30 or .35 Remington (with a smattering of other old-time chamberings thrown in). In the case of the former caliber, there’s a good chance Ol’ Betsey will be a Winchester Model 1894. Although preferences have shifted to bolt-guns or semiautos with scopes during recent years, plenty of these heirloom lever-guns can be found in gun racks or closets. More than 7 ½ million Winchester Model 94s have been built, plus 3 ½ million Marlin Model 336s, most of which are handy carbine-sized rifles with six-shot tubular magazines and 20-inch barrels. Many, no doubt have born witness to decades of sporting adventures involving legions of whitetail deer. The good news is that the same rifles that filled meat-poles in the 1940s (or well before) can still get the job done today. So, if funds are tight and Uncle Lou’s old Winchester is leaning in the closet, think about dusting it off for a closer look. The gun magazines often feature in-depth coverage of the latest AR-15s, fully decked out with all sorts of accouterments. By the time all is said and done, the cost for an assembled package will be well north of $1000, factoring in scopes and spare magazines. By comparison, the old M-94 will seem mundane. But, sometimes KISS can be good, starting with one obvious but overlooked lever-action trait; it’s a totally self-contained grab & go system. Next, note it’s an ambidextrous function. As for 30-caliber power, the .300 Blackout has surged into the AR scene (enabled in part by me) but, truthfully, the venerable .30/30 has it beat hands down. Granted, the tubular magazine won’t hold 30 rounds, however, with practice, an effective shoot & replace strategy can be refined. We call this “sustained fire”. And no one debates the handiness of a sleek lever-action, which is also less likely to incur the wrath of PC anti-gun politicians. Back to that dusty lever-gun. First, the obvious; check to make sure it’s not loaded. With the action open inspect the bore for obstructions and copper-fouling. The latter is fairly common and worth removing as part of a thorough cleaning process. You may see dust-kitties clumped into various nooks and crannies, including the rear sight notch. Most such rifles are bear their original open sights with a semi-buckhorn rear and small front bead. Some have been modified by their owners to accommodate a scope, which on earlier Model 94s often involved drilling and tapping the left receiver face for an offset mounting system. This odd adaptation provided clearance for the top-ejecting design of an M-94. Later Winchesters employed an “angle-eject” receiver modified to boot fired cases to the right, and a factory D&T hole-pattern permitted centered mounting of scopes. To me at least, the lines of a classic lever-action are spoiled by the addition of a scope. Most of these rifles are stocked for iron sights so, when scoped, the result is a loss of a good cheek-weld, necessary for optimum field accuracy. That said, there are lots of conventionally scoped rifles (mostly Marlins) in the hands of happy hunters, so it’s largely a matter of personal preference. A smaller number (mostly Winchesters) have been fitted with barrel-mounted “scout scopes” that employ longer eye-relief for location ahead of the receiver. They look strange but will work. However, since the theme here centers on the KISS principle, let’s start with iron sights. The factory-issue set will work with good eyes in normal light. But, as we age, presbyopia develops, accounting for a need for drug store reading glasses. Most of us are there by the mid-40s, making a small front sight difficult to resolve. Many game animals are more active during periods of low light, which makes things even worse. Here’s where the right receiver sight setup can save the day for only a modest investment. Shown is our family Winchester Model 64-A .30/30, built in the early 1970s. It’s really just a 24-inch version of the M-94, with a pistol grip and half magazine. Like many other lever-actions, the receiver is factory drilled and tapped to accommodate a receiver sight from makers like Lyman or Williams. In this case, mounting a simple Williams 5-D was a cinch, but the project wasn’t complete. More often, adding one will require a correspondingly taller front sight to maintain zero. The planned fix was a Hi-Viz fiber-optic unit with a bright green element which, visually, appears only slightly smaller than Planet Jupiter. Like others, various heights are sold, but this one comes with interchangeable F/O elements in various diameters and colors. Most folks might opt for a smaller element to gain more aiming precision but think about real-world use. The trick to the proper use of iron sights involves a focus on a clear front sight – in other words, one we’ll need to see! In dark spruce woods, 20 minutes after sunset, most conventional systems will disappear, so brighter is better. The rear “peep” is the other crucial factor, with a larger aperture being key. Most such sights are threaded for interchangeable aperture disks with holes of varying diameter. I stole this article from concealed carry today. Unscrew the disk and a large “ghost ring” will result; darned near perfect for such conditions. No, the resulting sight picture may not seem precise, but your eye will naturally center the bright bead in that expansive rear ring. At that point treat it like a dot-sight. Paste the F/O bead on your target and squeeze off a shot. With a proper zero you’ll have a good hit – probably one more centered than expected. We field a large AR-15 equipped force whose M-4 type carbines employ Aimpoint dot sights. They’re fast and intuitive but, believe it or not, accuracy-wise, results are on par with peep-sights. The latter gives up the 24/7 visibility of an electronic dot, but will still be a vast improvement over traditional iron sights. Step outside at sunset with the above F/O system and try aiming at various objects as daylight fades. Assuming you live where the local SWAT crew won’t arrive, expect useful results right up to the end of most legal hunting hours; 30 minutes after sundown. The fact that my M-64 has a 24” barrel is also no accident. Its longer barrel locates the front sight further from my eye to help overcome old-guy eye limitations. Sort everything out and you’ll have an effective rifle for little cost. The trick is to calculate the correct sight heights, which can be done with a dial-caliper and chart. Most shooters would be better off seeking a qualified gunsmith who will view the job as a routine installation. It’s also a good chance to ask for a thorough going-over regarding function and cleaning. While there, ask for a simple sight-filler blank to replace the rear sight, which probably will just become extra baggage. Don’t forget a provision for a sling, either. Good news though: You won’t need batteries for your sight! You can make this harder than necessary. Much as I appreciate high-end precision rifles, this isn’t that kind of deal. Although it may seem counterintuitive, to establish a zero, you may be better off by aiming at a big cardboard IPSC Target or other combat silhouettes. Otherwise, you could go nuts trying to precisely align the big F/O bead with a relatively fine bullseye. Again, just treat the big F/O bead as a dot-sight. I usually go with the biggest or next-to-biggest element, but the QD feature of a Hi-Viz will allow smaller combinations in tandem with various apertures. Although the threaded rear housing works as is, I jazzed things up with a Brownell’s Twilight Aperture that has a large hole. The three-shot group shown here typifies results with my 64-A and Remington 150-grain Core-Lokt; two-inches at 100 yards. Just for grins, I’ve lobbed a few at one of our steel rifle silhouettes from 200 yards. Perhaps due in part to the longer barrel hits were easy using a high-center chest hold. Things would be even better with Hornady’s new LEVER-evolution Flex-Tipped, 160-grain .30/30 rounds, which offer a more streamlined shape for flatter trajectories. Their soft tips also can be safely used in tubular magazines, eliminating fears of adjacent primer detonations; a two-for-one advantage. But sticking with KISS, I’ve settled on a more pedestrian load available in every Mom & Pop hardware store around here. I just wait for sales and score on Core-Lokts for around $15 per box. Shown left-to-right are a .300 Blackout, .30/30 Winchester, and .308 Winchester cartridge. The .300 Blackout is ballistically similar to the 7.62×39 Russian (AK-47 round), and although the .30/30 posts similar velocities of around 2350 fps, its bullet weights are higher (150 – 170 grains versus 123). Of course, the .308 is in a different league, cracking 2800 fps with 150s. Any of these calibers will take a deer with the right bullet out to 200 yards (more with the .308), but the .30/30 has an edge over its smaller rivals. Owners of .35 Remington Marlins are literally ready for bear (at least black ones), by virtue of 200-grain bullets starting out above 2000 fps. The trajectory will be loopier but still useful to 150 yards. Here in the wooded Eastern U.S., 100 yards is a pretty good poke with odds of further shots being rare. The bold sights are fast to acquire and intuitive to align, but they will cover much of a deer as ranges increase, making this more of a timber proposition. Of course, those in more open western spaces could always go with a finer element. Regardless, the sights will probably limit range more than the cartridge. On a positive note though, the classic stock will locate your eye right above the barrel. Shoot it both-eyes-open and the ghost-ring sights will prove deadly during fast-paced scenarios. Near the end of our week-long Basic Pistol program, we afford an opportunity for the class to elect their two top shooters. We’ll put them up against one instructor who is usually armed with an M-870 shotgun. Each “team” must clean an array of five steel knock-down targets located at 15 yards before engaging a central stop-plate. The point is to illustrate the effectiveness of a shoulder-fired weapon over a handgun. Sometimes two pistols will prevail, but that outcome is rare. I’ve switched to a .357 Marlin on a couple occasions, working on a smooth operation from the shoulder, and each time the old lever-gun absolutely pounded the hi-cap polymer pistoleeros. The point here is to learn to run the gun on your shoulder! Furthermore, think about sustaining its magazine capacity through a shoot & replace strategy. A Winchester or Marlin can be topped off through its receiver loading port so, with practice (assuming opportunity permits), you won’t run dry until the last round is expended. Ammo location plays a crucial role. Stock-mounted cartridge sleeves afford a complete ready-to-roll system, but they do pose weather concerns – more so when glazed with a layer of freezing rain. Once wet, they’re also hell on stock finishes while being difficult to remove. However, a typical 9-shot version will slip handily over your belt, affording a very useful ammo-management system for sustained fire. This organizer will beat loose rounds in a pocket while providing access regardless of position (as in kneeling). As far as a regimen, you could adopt an empty-chamber carry condition for routine on-foot travel. Just rack the lever when things get serious and either immediately fire, or top off the magazine from a good ready position. If you have fired a shot, load two rounds. From that point forward, sweep through the contents of the cartridge carrier in a systematic manner, shooting and reloading as you go – again, only if opportunity permits; the first priority being address of any threats. Once the carrier’s contents are expended, you’ll still have a full magazine in reserve, so begin counting down as rounds are fired. This is also a good time to contemplate an exit strategy! Of course, if your rifle happens to be a .357 Magnum, you could also be wearing a revolver in that caliber. Lefties have an advantage during sustained-fire since the rifle can be loaded while shouldered. Some M-94s can be fiddly regarding easy manipulation of cartridges through the gate, because the stack of rounds can shift a bit rearward during firing. It’s usually surmountable with practice but, if not, you can learn to speed-load two cartridges into an empty rifle. Drop one in the open action and stuff the second through the port while closing the bolt. It’s fast! Once these skills are perfected try shooting from prone for a quick refresher on Murphy’s Law. Yep, it’s different. Assuming you opt for the sighting system described above, you won’t need much else. In fact, with good eyes, you could even skip a peep-sight (although the bright front sight will still be useful). Some sort of cartridge carrier is worthwhile. Also, buy a sling to free up both hands. QD swivels will permit its removal when wet, and a simple nylon type will work. If your rifle lacks studs kits are available with a one for the stock and another that can mount to the magazine tube. Although it’s a DIY job for many, you might as well add this to your list of gunsmithing questions. Factoring everything in from sights to the sling, cost will be relatively low; under $100 for parts, with a bit more for any shop labor. This assumes you own a cleaning kit but, if not, they’re inexpensive. While on this subject, Marlins can be cleaned through the breech by removal of the lever and bolt. Another great item is a set of decent but not-too-large binoculars. I always have a small set around my neck while afield; and they’re an even more important commodity without a scope. Speaking of which, you won’t have to worry about your scope becoming pasted with snow, or hopelessly fogged. Go this route and you’re pretty much weatherproof. While on the subject of extras, a great addition would be a similar rimfire lever-action, equipped with the same sights, and chambered for .22 LR. Being manually operated, it’ll feed about anything including quiet, low-powered CCI Quiets, .22 Shorts, or CB Caps. Discontinued used Winchester M-94/22s are pricey and Marlin M-39s aren’t cheap so, at this point in time, the most affordable .22 will probably be one of the nice Henrys. They also make great trainers although, typical other rimfires, a receiver loading port is absent. Shameless plug: For more about .22 rimfire rifles you can check out the Rimfire Rifles: A Buyer’s and Shooter’s Guide edition, available at Amazon – click this link to check it out at Amazon.com. Henry also produces a series of nice centerfire lever-guns. Like their rimfires though, the magazines are filled through the front end, precluding sustained-fire techniques. Marlin is still building classic lever-actions and both firms also offer rifles chambered for revolver cartridges like .357, .41 and .44 Magnum. But for purposes here, they complicate the concept of resurrecting an existing firearm for minimal expense. The same premise will work with plenty of other dusty sporting arms including box magazine-fed Savage M-99s, Remington M-7600 pumps, or M-7400 autoloaders, etc. Keeping a lid on related firearm costs will free money for numerous other Prepper essentials. Later, if a more sophisticated rifle is desired, why not hang on to Ol’ Betsey? After all, it’ll still make a darned good spare with, perhaps, a bit of nostalgia thrown in. My first and still only rifle, the Winchester Model 94 .30/.30 with iron sights I can take any game in my area, (East Texas), it will also serve as a self defense rifle if need be. Nothing wrong with a classic.